Unibrain introduces USB 3.0 adapters for the professional and machine vision market, featuring Four (4) separate, independent USB 3.0, 5 Gbps channels on a single PCI-e x4 slot. Each USB 3.0 bus takes advantages of 5 Gbps burst rate providing the ability to transfer data at ultra high speeds or get high resolution pictures at high frame rates from multiple cameras. 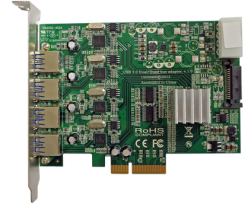 Unibrain Quad bus USB 3.0 Host Controller is based on Renesas uPD720202 chip and PLX PEX8608 PCI-e switch controller. Native driver support for Windows 8 & 10. For Windows 7 only, Download Renesas Driver (For Windows 8/10 the native driver should be used). Linux (Kernel 2.6.31 or later). Two/Four separate USB 3.0 buses. Two/Four independent 5 GT/sec (500 MBytes/sec) PCI-e v2.0 lanes. Two USB 3.0 port for each bus on the Dual bus adapter. One USB 3.0 port for each bus on the Quad bus adapter. Internal power connector (4 pin, ‘big’ IDE) for extra power stability. Legacy connectivity support for USB 2.0 devices. Humidity Operating: 0 ~ 80% RH, Non-condensing. Compliant with Universal Serial Bus 3.0 Specification Revision 1.0, which is released by USB Implementers Forum, Inc.